Sylvania students didn’t take long to discover the common area built by the Office of Planning & Capital Construction as part of the bond improvements in the CC Building’s Upper Mall. 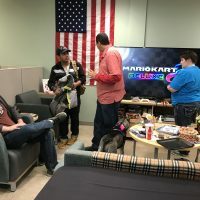 The Sylvania Campus student resource centers are more resourceful than ever now that the college has completed the latest phase of the extensive improvements in the College Center building. 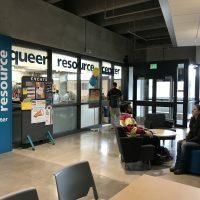 For the first time in the campus’ history, the resource centers for student leadership, women, veterans, and multicultural and LGBTQ+ students are located adjacent to one another — and highly visible — in the north end of CC’s Upper Mall. 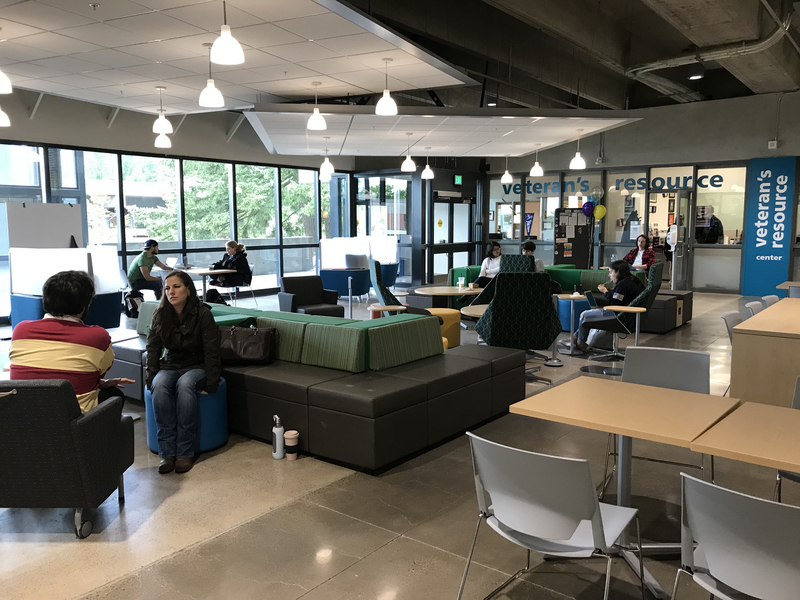 In addition, the new resource centers now share a large, light-filled common area for study and relaxation. The multi-phase work being done at the CC started in 2010 and represents nearly 75 percent of the $71 million in Sylvania campus modernization funded by the 2008 voter-approved bond measure. Dean of Student Success Heather Lang speaks at the grand opening of the Sylvania resource centers. 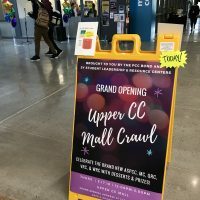 To mark this latest milestone, the college celebrated in mid-May with a “Mall Crawl,” featuring open houses at all of the resource centers, a raffle and remarks from college leaders. Linda Degman, director of the college’s Office of Planning & Capital Construction, noted that the building was originally constructed in 1968 in the era’s popular “brutalist,” concrete-heavy style of architecture. Not only was the building dark and — to many people — oppressive, the CC needed to upgrade seismic safety, ADA compliance and accessibility. Co-locating vital student services and resource centers was also a priority. 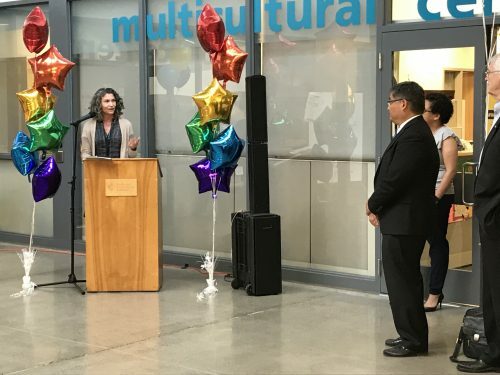 Also in attendance were President Mark Mitsui, three members of PCC’s board of directors — Michael Sonnleitner, Jim Harper and Valdez Bravo — as well as representatives from GBD Architects and Howard S. Wright Construction. 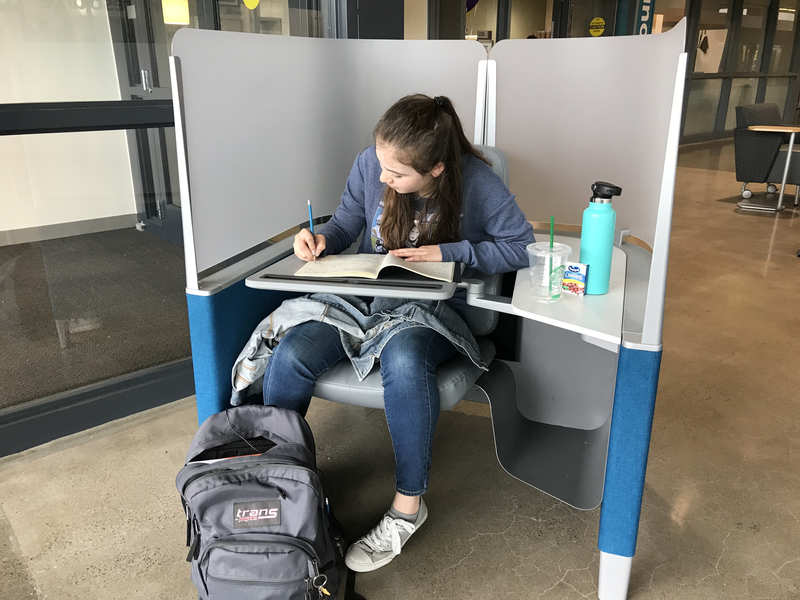 PCC Sylvania student Anna Mueller enjoys working in the study pods in CC’s new Upper Mall common area. The pods feature an ergonomically designed chair, adjustable desk, and opaque screen that reduce distraction and help her stay on task. During the open house, it was clear that the renovations have already had an impact. 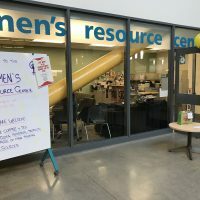 Staff at the resource centers all described an increase in foot traffic from students, as well as enhanced communication among colleagues. Among the fans of the new pods is Amanda Bluhm, a second-year student studying prerequisites for a career in occupational therapy. Degman noted that while the college is wrapping up the remaining 2008 bond work, it’s also ramping up plans for projects associated with the 2017 voter-approved bond. This work includes modernizing Sylvania’s HT Building, constructing a new public safety building for Cascade Campus, and a childcare center at Rock Creek. There are 2 comment for this article. If you see something that doesn't belong, please click the x and report it. Can you provide a link to where study pods can be purchased? Those study pods are known as Brody desks and are made by Steelcase. You can find a link to several retailers on the company’s website: https://www.steelcase.com/products/desks/brody/. PCC offers this limited open forum as an extension of the respectful, well-reasoned discourse we expect in our classroom discussions. As such, we welcome all viewpoints, but monitor comments to be sure they stick to the topic and contribute to the conversation. We will remove them if they contain or link to abusive material, personal attacks, profanity, off-topic items, or spam. This is the same behavior we require in our hallways and classrooms. Our online spaces are no different.